Our program is designed to resolve your debt for significantly less than you owe — as quickly as possible. 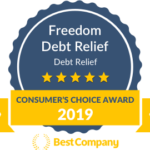 First, one of our friendly Certified Debt Consultants walks you through a range of debt strategies to help determine if our program could be the right solution for your debt. It’s a short, no-obligation phone call. To request a call now, click here. Each month, you make a monthly deposit into an FDIC-insured Dedicated Account that you control. Your Dedicated Account is the engine that drives your program. As you build it, our negotiations team creates a custom strategy to get you the best settlements. You can track your Dedicated Account any time, using your online Client Dashboard. FDR knows the best time to start negotiation, what type of settlement to negotiate, and how to leverage a settlement with one creditor to get a better settlement with another. We use this insight to create a negotiations strategy just for you. As soon as you build up enough funds in your Dedicated Account, we put this strategy into action and a member of our negotiations team contacts your creditors. Together, they discuss how much your debt could be reduced and arrange a settlement that offers the most savings possible. Each time our negotiation experts reaches a settlement with one of your creditors, we immediately contact you for authorization. Your authorization is required for every single settlement. Regardless of the term used, you no longer owe on any of your enrolled accounts once they are settled — their balances are zero. Your debt is behind you!